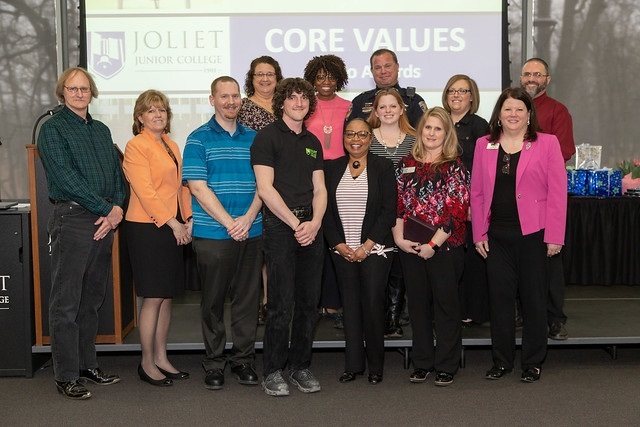 Over 120 Joliet Junior College employees were recognized for their service and eight were presented with awards at the annual Spring Employee Recognition and Core Values Reception April 4. Faculty and staff, whose collective experience spans 1,375 years, were honored with from five years of service to more than 30 at the college. Awards were also presented to employees who’ve exemplified JJC's seven core values. JJC promotes and encourages a workplace culture in which employees live out the college's core values every day, whether in their interactions with each other, students, or community members. Employees are encouraged to nominate their peers, which are reviewed by a committee. Award winners are recognized each month with a certificate and lunch with President Dr. Judy Mitchell. From those recipients, a single winner is selected annually for each category. The seven awards are named in honor of the late Jo Stworzyjanek, a former JJC Human Resources staff member. It is not uncommon for Diaz to go above and beyond for JJC Students. She often stays late on testing weeks in the Testing Center to finish proctoring exams. This ensures all students, including evening students, have the same amount of study and preparation time before their high stakes final exams. Her service fosters a positive environment for the well-being of JJC students. Ferconio is part of a team that is responsible for the installation of key safety items such as cameras, door access, and locks. The process can be both mentally and physically challenging, and requires a great deal of work and talent. Not only does Ferconio complete these projects in a timely manner, it is not uncommon for him to work on a weekend or holiday to fix issues that arise. His services makes JJC a safe place to work and learn. Wordlaw’s dedication to her job, displays of responsibility and accountability, are model of integrity. It is not uncommon for her to come in early to set up before the college opens and then stay late to finish tasks, as needed. She works with students and parents who are needing assistance with any problems they’ve encountered. She’s also been known to step up to help other departments in the event of unforeseen circumstances. Braun is currently juggling several different duties and responsibilities both here and at JJC’s extended campuses. She keeps her staff motivated and takes time to recognize their successes. Recently, Braun assisted a fellow coworker who was walking with a cane and juggling their breakfast trying to get back to their office. Although it was in the opposite direction of where she was going, she took the time to assist the coworker. Connelly inherited handling the process for the SURS fees. She has done a remarkable job in setting up and managing this process, which included creating a way to track, manage and pay assessed penalties. However, this person goes above and beyond by appealing many of these charges and checks for errors or opportunities to appeal and reduce fines. Connelly’s knowledge and attention to detail in the appeal process has saved the college over $800,000 in penalties and fees. Solley has been a staple at JJC for quite some time. He is responsible for many of the behind the scenes coordination and execution of events. Solley has been responsible for coordinating a significant amount of large, high profile events. In addition, he’s also responsible for ensuring that countless smaller department events, meetings, external events, office moves and other needs are met accurately and in a timely manner. One of JJC’s institutional priority projects is gainful employment. Cassan’s role in this area requires a heavy tie to compliance and creative thinking in order to provide a timely solutions. This person also took on the responsibility for implementation duties as well. He utilized a current system which saved the college money. Cassan has gone above and beyond by attending meetings to explain his solution and provide input and insight into best practices, as well as guides his colleagues to the correct solution. He’s executed these services with a positive attitude. Presented for the first time in the history of the Core Values awards, All-Core went to JJC President Dr. Judy Mitchell. As the person who helped revive the process, she represents all the core values every day. This includes her continuous respect for others, collaboration with every department, commitment to sustainability, and innovative ideas. Mitchell’s support has allowed the Core Values Committee to grow and become an integral part of JJC.